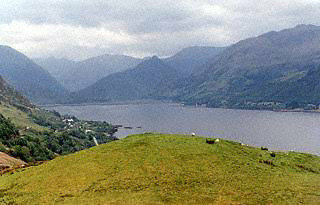 This is the general area where Alex has a meeting with fate in "Radio Lochdubh" in the second series. The actual location used is a couple of miles further south and involves quite a long steep walk over a forestry track but a very similar view can be had here. Continue along for a couple of miles to the top of Carr Brae where there is a parking area on the right with a gate giving access onto the viewpoint.